From 2020 Vision, by Bill and Amy Stearns: “Why do we often worry about whether God will come through for us? Why can’t we spend the ‘last’ 75 years of our lives in solid confidence of His working in our lives and feel deeply satisfied with life? Perhaps because somehow we’ve gotten the idea that God is supposed to respond to our pleas, to what we feel are our needs. And often He doesn’t. We become disappointed with Him and – perhaps without ever hinting at such blasphemy – feel that He’s unreliable. The prophet Jeremiah felt exactly that way in his life of troubles; he complained to God, Will you indeed be to me like a deceptive stream with water that is unreliable? (Jer. 15:18) The KJV of that passage puts it about as forcefully as a translator would dare when speaking to God: Wilt thou be altogether unto me as a liar, and as waters that fail? Do you get the critical point here? God won’t always do what we think He should, but He will always keep His word. So when we think that God has promised to heal and He doesn’t, we must have misunderstood or misapplied that promise. We must understand that God never fails to do what He said He would. There is no force in the universe that is strong enough to make Him break His promise. Let us pray for wisdom to better understand what God has said He will do – and not to put our expectations on Him as if we were the potter and He were the clay! PRAYER: God, we need to be filled with understanding and to be reassured that You are absolutely, totally reliable and trustworthy. We know in our head that You are, but in our fear we sometimes doubt. Increase our trust! In Jesus’ name, Amen. First, a word of explanation: I am on a new “kick”. I suppose we all get on a kick from time to time, but this one has been especially meaningful for me in light of all that has happened in the past couple of months in our world, and in the past couple of years in my life. As a result, there are lots of things I look forward to sharing with you in these DayBreaks in the next 30-45 days. I will still try to mix it up a bit…but you’ve been forewarned, so sit down, strap in and hold on because we’re going on a journey together starting today! In Ruthless Trust, Brennan Manning told the following story: “When the brilliant ethicist John Kavanaugh went to work for three months at the ‘house of the dying’ in Calcutta, we was seeking a clear answer as to how best to spend the rest of his life. On the first morning there he met Mother Theresa. She asked, ‘And what can I do for you?’ Kavanaugh asked her to pray for him. I have become more and more convinced that the secret of the Christian life lies in trust. Some may say this is a semantical argument, but I don’t think so. Some would say it is faith or life in the Spirit. Sure, but you can’t have faith in someone or something that you don’t trust. Faith and trust both grow over time with experience, but is in the dark nights of the soul that trust rules the roost. Trust has been a bit hard to come by in the past few months. We used to trust in our safety in the workplace. That’s gone. We used to trust that our fellow-man was generally decent and law-abiding. But we don’t trust that quite so much any more. And where we once opened our mail without a second thought, we now look twice at postmarks and return addresses and suspicious bulges in envelopes, don’t we? Where we once felt relatively secure in our economy and our jobs, who among us hasn’t at least wondered a bit about if (and when) the pink slip might come our way? Can we be really honest with each other for just a second? All of our lives are a mess. We have all languished in the darkness to varying degrees. Even these heroes of the faith did. Read Jeremiah and then tell me that you think his life was peaches and cream. Or King David. Or the apostle Paul. Don’t miss what the passage from Hebrews is saying: “THEY DID NOT RECEIVE THE THINGS PROMISED; THEY ONLY SAW THEM AND WELCOMED THEM FROM A DISTANCE.” They didn’t get clarity in their day-to-day life, other than to know that they longed for a “better country” and they trusted that if it existed, it would be God that held the key to getting there. That is trust, and trust is what gave them the ability to endure the horrific things listed in the rest of Hebrews 11. 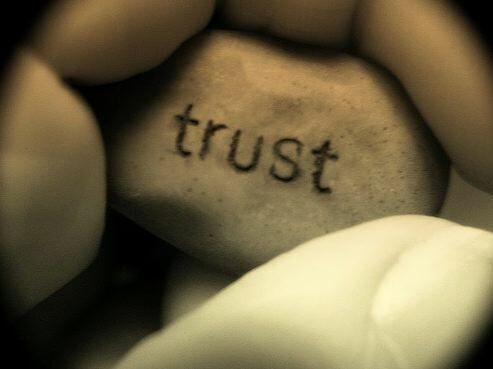 If trust worked for them, I have a hunch that if we understand it properly that it will work for us, too. It’s not a magic elixir, it won’t likely bring daily clarity, and you can’t produce it on your own. But trust happens! Let’s take a journey together and explore this thing called trust. I’m convinced it is the key to the Christian life – to our strength, our humility and our ability to persevere! Copyright 2011 by Galen C. Dalrymple.